Drawn by Don Perlin, this woman who looked like the female demon from Ghostbusters, had decided to 'face off' with the Autobots in a whole new way. It wasn't shock over the fact she hadn't learnt red meant good and purple meant bad, as all other 80's folk had, it was the fact Circuit Breaker didn't care. She hated all robots equally. While decapitation is now is a regular comic thing, back then it was still extremely rare, and rare in the extreme. Although Josie Beller was never punished properly for her experimentations, that just isn't how you get a head in life. Optimus, when somebody asks you if you are a god, you say yes! i remember this, but it was only a few issues later that i dropped the series. still cool to see this i had forgotten about it. LOL Random, now I know we don't need blood tests - we are twins. Bad news is you are behind a few birthday presents. Put whatever you want outside and park my new helicopter on the lawn. Dave - people may drop the TF from their pull lists, but never from their hearts. Me I even debate with myself over how perfect I can get the Transformers transforming sound. Note to the wise; never make it during 'adult' time. Never goes down well. Never saw this particular issue, but wow, what splash page indeed! 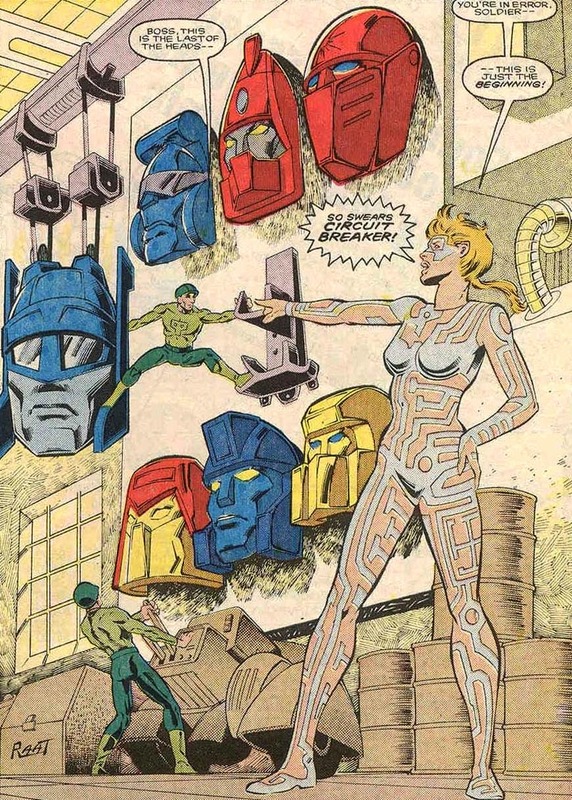 Circuit Breaker would look better when artist Andrew Wildman and some other drew her, but a very neat character and idea. She was a human with powers with a pure hatred for all things robots based off her past. Remember the Neo Knights group that formed later on to fight the Autobots/Decepiticons Dan? That's the one Dale, Marvel must've had some big plans for her at some point though, as they debuted the character in Secret Wars II so they could claim any future royalties and creation rights to her options. Yeah the Neo-Knights... Back when neon colours were all the rage yet not really tied in. Transformers was a great book like that, it really expanded the cast out. They didn't have an awesome redhead with a kiwi accent save the day though, but I heard it was on their to-do list.